10 x € 18.00 / month ? The Linkstar DL-500D studio flash with 500Ws flash power has a complete digital display, for precise control of you flash unit. This studio flash is adjustable from (1/32 up to full power). 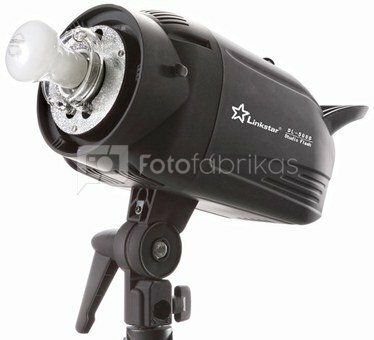 The studio flash is supplied with a 60W modeling lamp with a color temperature of 5500K max. 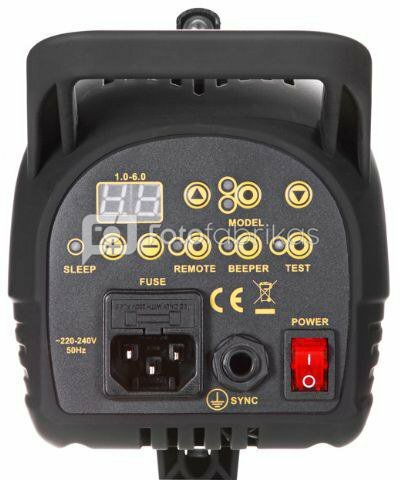 The built-in slave function makes the studio flash suitable for usage in combination with other studio flashes. 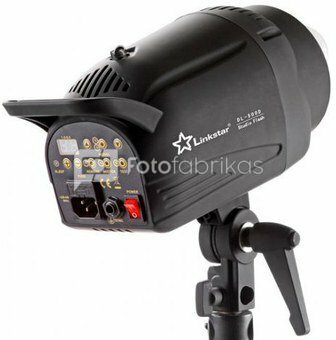 The Linkstar studio flash DL-500D is very suitable for setting up a small studio or passport photograph corner. Because of its compact size and light weight the Linkstar studio flash DL-500D is also very suitable to use on location. You can easily replace the flash tube yourself. The studio flash is packed in a full color box and comes with all the necessary cables. There are various optional accessories available for the DL-D flash units, such as a barn door set, snoot, color filters, honeycomb and soft boxes in different sizes (see optional accessories). These accessories can be mounted on the studio flash by using the S-type bayonet.